At the end of the first issue, I asked if Wonder Girl fans would be happy with her limited involvement and vague background. By the end of this second issue, I’m sure they’re fine. If not, they’re insane. Bendis creates a narrative and subplot and drives home his version of Cassie Sandsmark within just a few pages. When I think Bendis is driving into typical team book territory, he swerves, backflips and ghostrides down another path as if he’s starring in the new “Fast and Furious” movie. I rolled my eyes at the thought of the team being scattered (even though its in another world and even though every moment from last week that got us to that point was so much fun). I doubted Bendis. Here he takes that predictable dynamic and gives us extremely brief moments with the newer characters. Not quite enough to glean any real characterization from it, but enough to keep me wondering why we haven’t had that moment yet. Those predictable moments are quickly washed away from memory as he smashes the team back together again (for the most part) and doesn’t explain a single thing. Which is totally fine. Take your time and pace this out. This is one of the few superhero books that doesn’t feel like its being written with the collected edition in mind. In fact, if this “arc” wraps up in six issues, I’ll be legitimately surprised and probably a bit disappointed. If this Young Justice team was stuck in Gemworld for another two arcs I’d be just fine with that. Granted, by then I fully expect to SEE the Teen Lantern. That’s probably my biggest gripe so far. Hell, I wouldn’t call it a gripe. I’d rather call it a nitpick. Nope, even that seems wrong. It’s a mystery that is playing out in front of the characters so I too am fully along for the ride. Here’s hoping she doesn’t have dead parents. The action in this issue is very very brief, but that doesn’t mean the art took a backseat. Pat Gleason’s portrayal of Cassie (and the rest of the team) is outstanding. Gleason makes the big bad evil guy look downright terrifying. When Amethyst attacks the bad guys, she literally brightens up the scene and beyond her quip, her motion livens up the entire page. 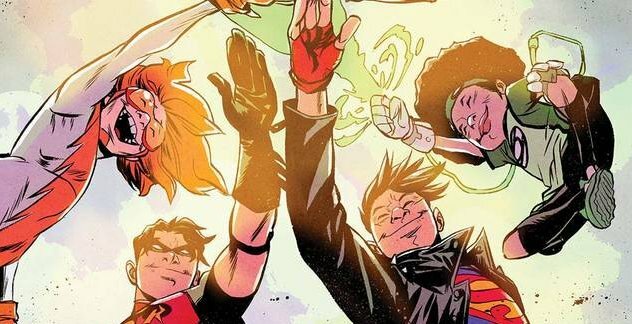 I said last issue that Gleason was one helluva run right now in his career, and luckily us Young Justice fans get to experience that firsthand. Anyone viewing these pages has been blessed, this is Patrick Gleason showing off and wow does it look fantastic.